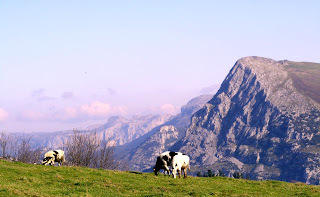 Soba is a very beautiful and important valley and it gives name to a delicious dessert called "Sobao", very typical from Cantabria. You can also find here the source of the river Ason, with a spectacular waterfall in a precipice. This time I took my bike with me because I wanted to finish the route soon enough to take the train back at 14:20 (otherwise I would need to wait for the one at 20:50). My route didn't pass by the waterfall though. I wanted to cross the mountain range "hornijo" trough an aperture that people from Ramales know as "La Canal de Ancilla" and people from Soba call "Ventana de las Trapías" (I checked it, by the way). Here is a link to the route in Google Earth. 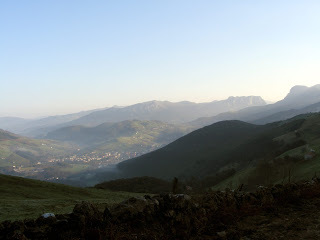 I took a FEVE train in Santander at 8:00 and arrived at the village of Gibaja at 9:22. From Gibaja I ride my bike through a general road to the nearby town of Ramales where one can contemplate the astonishing figure of the peak San Vicente (not the highest one in Hornijo though) and "La Canal de Ancilla" (see the picture above). Note that normally the ascension to San Vicente is not done from its north face but from the south (we will see it in another picture). The ascension from there was very hard and I had to go on foot most of the time. On the entrance to "La Canal" a bunch of dogs came barking at me in a very aggresive way. I think this should be illegal, prosecuted and punished. This people with aggresive dogs must think they are the only ones allowed to walk in the area. Crossing "La Canal" was really hard because I had to walk and hold my bike at the same time. I was exhausted!! (I retouched my face in the picture to make it clear, haha) There was not a clear path, lots of stones and bushes so it was not appropiate for a bike at all. I do not recommend anyone to do the same, it requires a bit of experience and being crazy!! 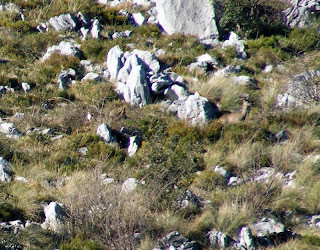 I managed to see some deers (I guess) and took some pictures of them. When I finally crossed "La Canal" I could see the amazing views of the valley of Soba. I took some photos to convert them into a panoramic one. I had planned to go a little bit to the west but I didn't have enough time for that (going through "La Canal" was harder than expected) so I decided to go downhill. Now, the pain of taking the bike on my shoulders there was finally worth the effort. It was a real pleasure to go down the valley. 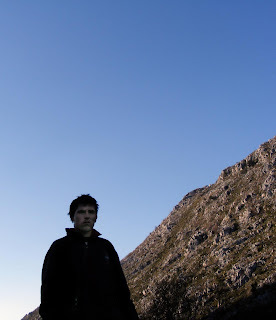 Above we can see the south face of the peak San Vicente which is normally accessed through the village of Manzaneda. Finally I arrived at the station of Gibaja 20 minutes ahead. I had the chance to talk to the station chief who is from Santander. He told me that the station is driven in the old way ("bloqueo telefónico") which means that the signaling is not automatic but through asking-giving permission by voice calls (the signals are then controlled by him through a laptop).